Foundations: 75 BA piles cast between 8 and 12m deep. Earthquake level 2 construction. The structure is wrapped in a technical garment adapted to the uses and orientations. This framework envelope laminated pine Douglas fir has varied qualities according to needs: opaque, transparent, translucent, waterproof, porous, filtering, insulating ... and framework glued laminated pine. The facades of the offices are designed on a modular principle plug on the regular frame of the structure. 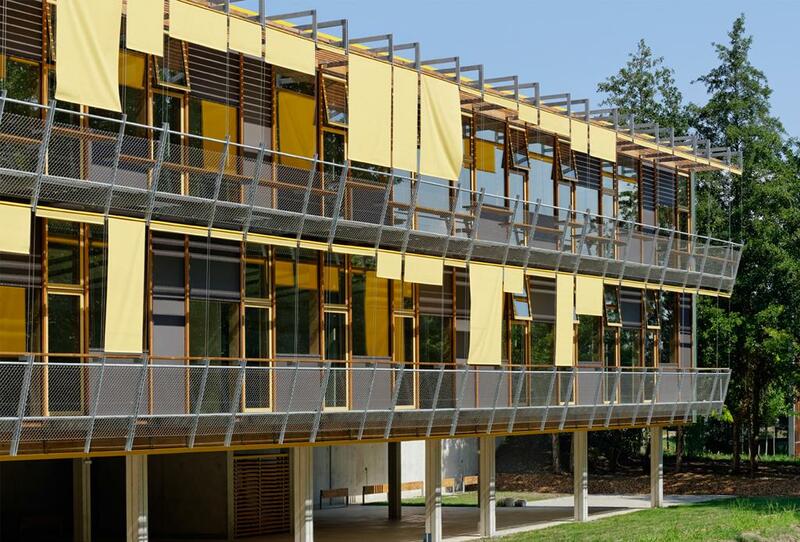 This system is designed to allow a simple and fast modification of the facades while guaranteeing the air, water and continuity of the sound and thermal insulation.